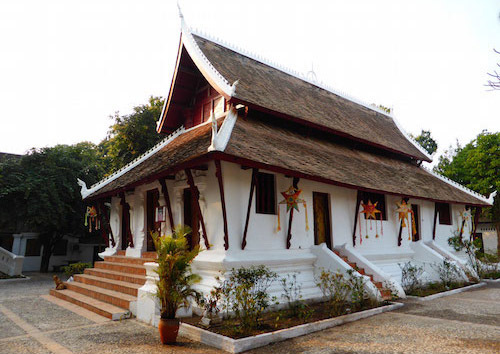 At the very tip of the historic Peninsula in Luang Prabang lies the centuries old and important temple of Vat Pak Khan. 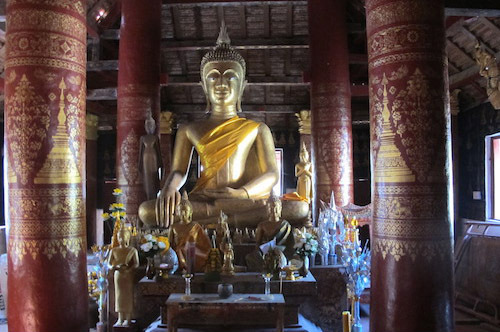 Founded in in the mid-1700's by traders on the Mekong River, who would stop at the welcoming confluence of the Mekong and Khan rivers, the temple has risen to importance in the culture of the town. 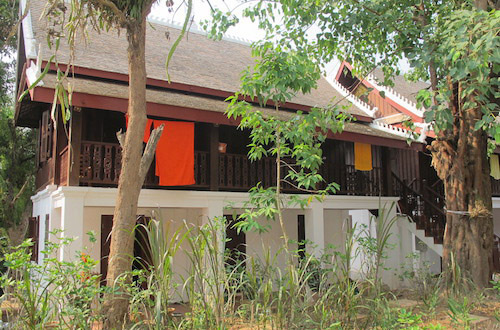 It is the home of our esteemed abbot Pha One Keo Sitthivong. 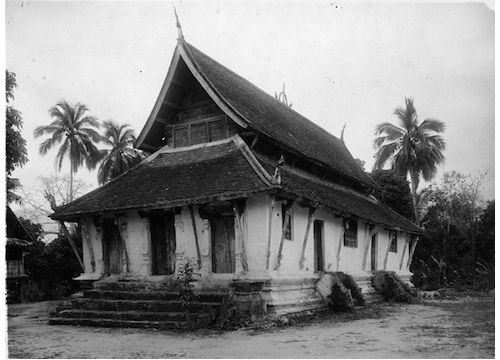 Alas, centuries of neglect, in spite of several intermediate renovations, left the temple and in particular the living quarters, or Khutis, of the monks and novices, in very poor condition, while the bathing facilities had become woeful. 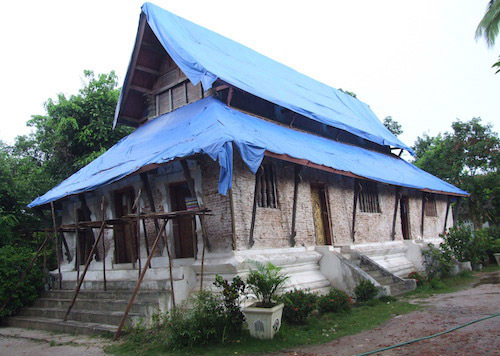 As it's first endeavor into major historic restoration restoration work, the Buddhist Heritage Project began extensive restoration and the construction of new buildings in 2011. The works were funded by the Badur Foundation of London. 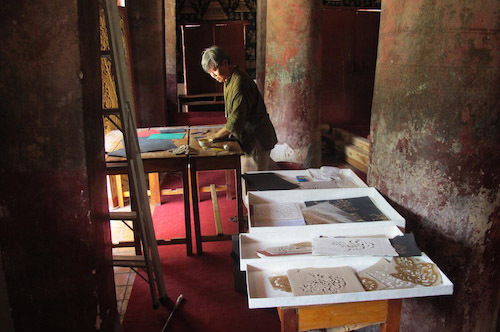 In collaboration with with staff from the UNESCO World Heritage office, particular attention was paid to conforming with traditional elements and the use of traditional materials. 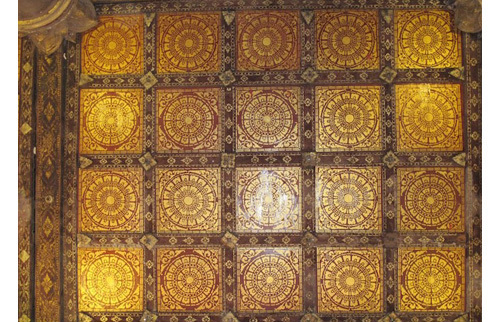 The result (which can bee seen in some of the photos below) was the complete restoration of the Sim, including the stunning interior gold stencil work; the construction of new, clean and comfortable accommodations for the monks and novices, the construction of new sanitary and bathing facilities, and complete renewal of the landscaping. Upon completion a major ceremony was held to commemorate the work. An historic photo of the Sim, (or Chapel), at Vat Pak Khan, made in the 1930's. From the collection of Buddhist Archive of Photography. The Sim at the beginning of the restoration process. Crumbling exterior plaster and ageing roof tiles removed, and all protected with plastic sheeting. 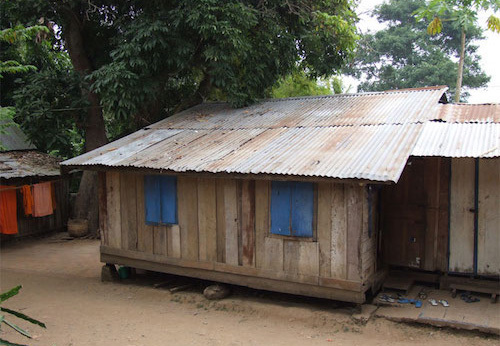 Prior to restoration the monks and novices lived in appalling conditions. 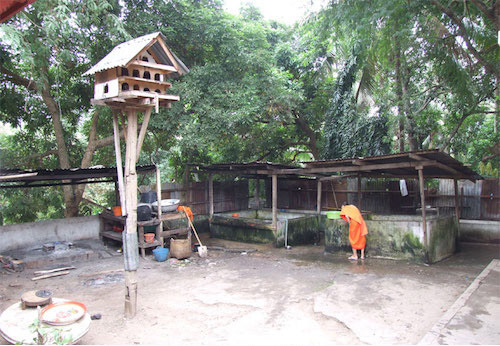 Here we see their bathing and washing area; decayed, crumbling and open to public view. The newly built bathing and ashing area just prior to the completion of construction. Clean, modern and private! A typical Khuti, or living quaters, at Vat Pak Khan prior to the renovation. These poor quaters were demolished duing the works. The following image shows an example of their replacements. The new Khuti buildings with a total of sixteen clean well-equipped living quaters made a dramatic difference to the lives of the monks and novices of Wat Pak Khan. During the restoration of the Sim, Regular meetings were held with members of the UNESCO World Heritage office. 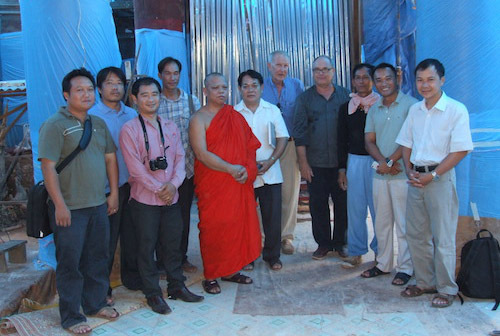 Here the Abbot Satthu Nyai One Keo stands inside the Sim with senior Project members and staff, the Architect and his staff and senior personnell from the World Heritage Office. The delicate task of removing the centuries old gold stencilled wooden wall panels from the Sim. Each to be inspected, documented, cleaned and resotred, or replaced if too seriously damange. 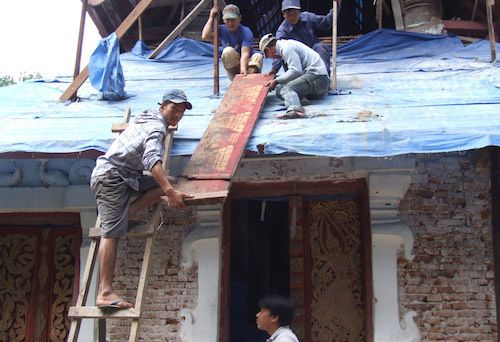 Ceiling panels removed from the Sim are painstakingly cleaned, measured and documented by Buddhist Heritage Project staff. 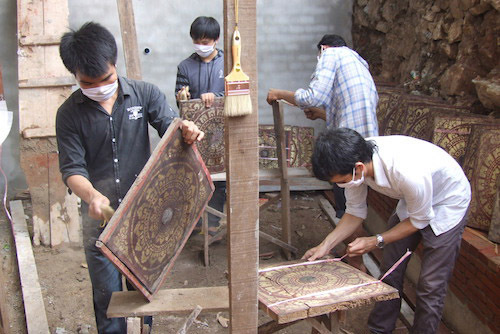 Each was treated with new gilded stencilling and the wood itself with an anti-termite solution. Inside the Sim a highly Artisan begins preparation for the complete restoration and replacement of the dog stencilling on the walls and columns. The process would take months and achieve a superb result. An example of the resotred gold stencilling on the walls of the Sim. The background colour, although it appears black, is in fact deep indigo using naturally sourced traditional dyes. One section of the ceiling panels in the Sim at Vat Pak Khan re-installed following their careful restoration. A view of the main altar and Buddha statue in the Sim, with the renewed stencils visible on the columns. 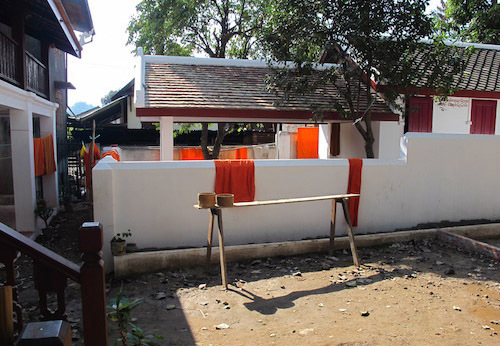 The base red pain was re-created from a traditional recipe using local red clay and the sap from a Lao tree. 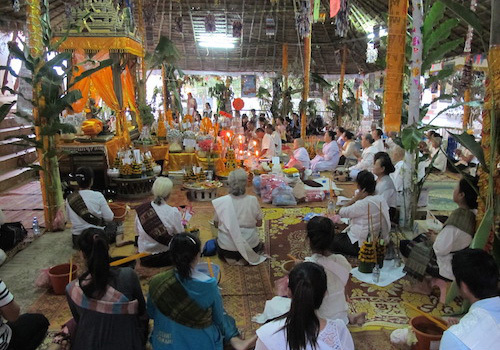 Hundreds of faithful lay people attend the first ceremony Boun Preveth, held at Vat Pak Khan immediatly after the restoration works. 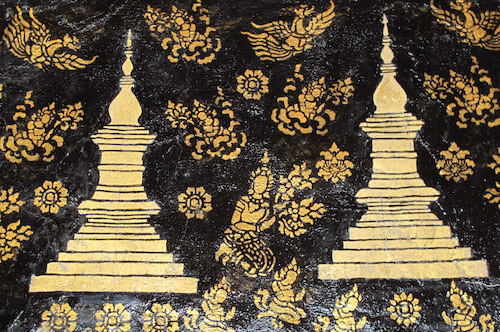 Later in the year, incelebration of the end of Buddhist Lent (boun Ok Pansaa) the newly restored Sim of Vat Pak Khan glows with these shimmering papter stars, made by the novices for the Festival. 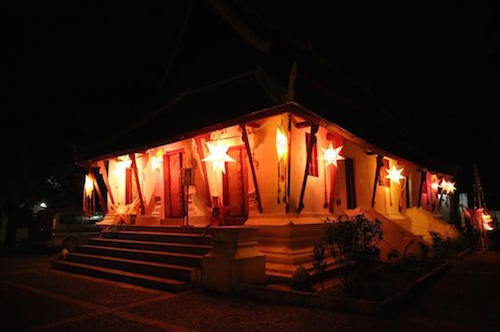 Finally a daylight view of the exterior of Wat Pak Khan Sim, with its paper star decorations celebrating the end of Buddhist Lent.